I still haven’t seen everything in Paris and likely never will…which is perhaps why I keep returning. A number of places in this list which I visited over the past few days are new for me. 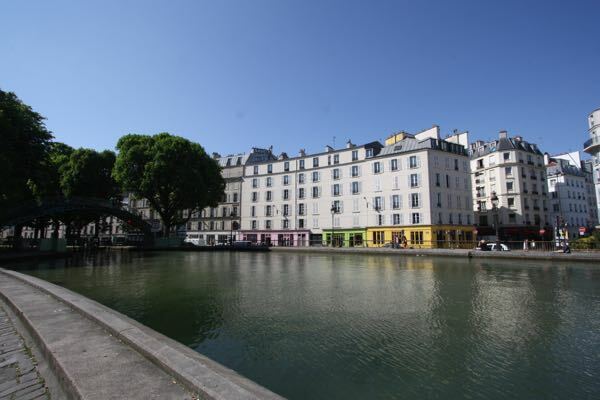 I had visited Canal Saint-Martin years ago, but never fully appreciated what it was like as I hadn’t gone far enough north. This time I covered the entire canal. And while Montmartre was packed with tourists, I did enjoy a new street leading there: Rue des Martrys–sophisticated and quiet. Civilized. If you have done the Top 10 or Top 20 that every guide suggests, try these places for something refreshing and different. I ventured north east to Buttes-Chaumont, a large park in the 19th arrondissement built in 1867. 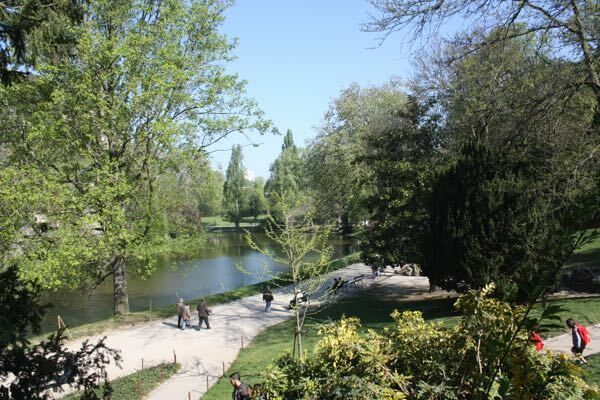 It is the fifth largest park in Paris and has a temple on a cliff above the waters of an artificial lake. There were many runnings out as well as school kids preparing for a go-cart race. From the left bank it took 2 metro changes and about 45 minutes but it was worth the trek. From Buttes-Chaumont, I walked to Canal Saint-Martin via Place Republic where signs of the Charlie Hebdo protest and mourning took place. 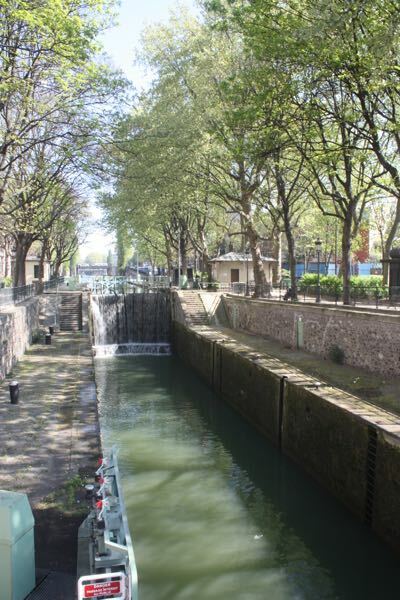 Yes, Paris has a canal and it was a perfect place to have my picnic lunch. I walked from the north end, near La Villette, southbound to Rue de Marseille where I ventured off to go to “Du Pain Et Des Idees”. 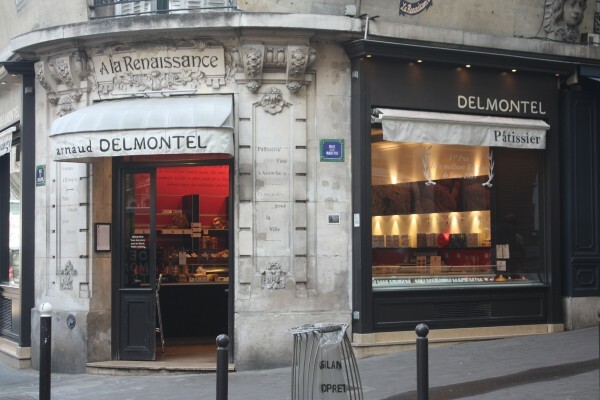 It was voted in 2008 as having the best bread in Paris. Based on David Lebvotiz’s app, “Paris Pastry”, I purchase a chausson aux pommes (apple in pastry) and it was delicious. I also bought the Pain des Amis as it is what locals buy. It was heavenly too.Sadly, the renowned Pain du Petite Epeautre et Crains de Courge (bread with pumpkin seeds and much more) is only available Tuesdays and Fridays. Merde! Guess it means I will have to go back…one day. I visit this area with each trip. There are so many streets with interesting shops like Fluxe which is a kitchy type of store with unique items. There are also a number of chain stores. I swear I saw a Nike store there. What I really enjoyed, however, was having a kir (wine and cassis liqueur) at Ma Bourgogne in the Place des Vosges. The large courtyard is surrounded by beautiful buildings, including the Victor Hugo museum (his house for 17 years) and it is interesting to visit. There is a new section just north of the Marais called “La Jeune Rue”. There isn’t a street, per se, called this. It is an area that just started to develop last year and it focuses on local foods, farm to table cooking, organic produce, and concept stores. No chains here. There was a lot of construction going on and I think this area has great promise. After departing from the Metro at Notre Dame de Lorette, I walked north along Rue des Martyrs in the 9th arr. where sophisticated shops are in abundance. I HAD to buy a baguetee at Arnaud Delmontel Boulangerie as he was the winner of the 2007 Best Baguette. I munched on it while sipping a delicious Cafe Creme at Le Pain Quotidien (The Daily Bread) which carries super organic breakfast and lunch dishes and drinks. There are outlets throughout France and many other countries including the US, but sadly, not Canada. When I reached Montmartre there were tons of people and booths set up selling foods. Was this a holiday? Everyone seemed to be out! 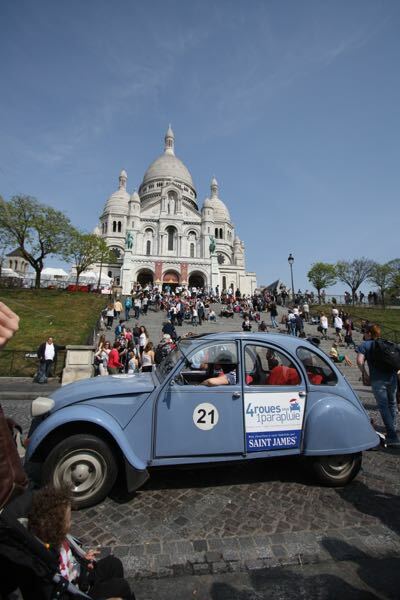 It was my luck that a vintage Citroen was sitting infront of Sacre Coeur. Not sure why I love those cars. Perhaps it’s because they are just SO French. After circling the church, I ventured down Rue Lepic and had a kir at the restaurant made famous by the movie, “Amelie”. As expected, it wasn’t like the movie, but the Kir was good. On average I am doing 6 hours of walking a day and fortunately, no new stress fracture! Amazing how there are so many places we have all not explored. 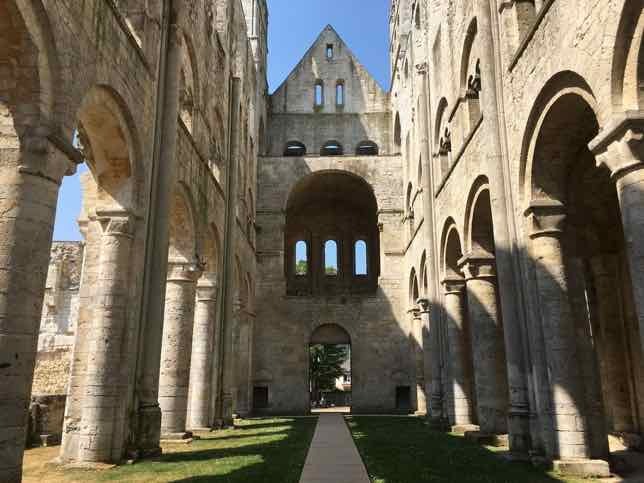 Nice look at some under visited places in Paris. Thanks. And I keep seeking out new places in Paris and France. I learned lots of things from this post…kir, best breads, French canals, La Jeune Rue, and a Rue des Martyrs. Very helpful when I finally get back to Paris since I have been to the usual! Thanks. We’ve been to Paris so many times, but each time I leave I think I’ve only scratched the surface…and never got to some charming places that I know are out there. I’m especially interested in your suggests for the best baguettes. I sometimes dream of baguettes and croissants in France and wake up sad I’m not there. There are some who would not understand your sentiment….but I do! I love finding the off-the-beaten track locations wherever I visit, so I see why you like doing this with Paris. I dream of baguettes and croissants, but could never live in France because I’d overeat myself into serious obesity! 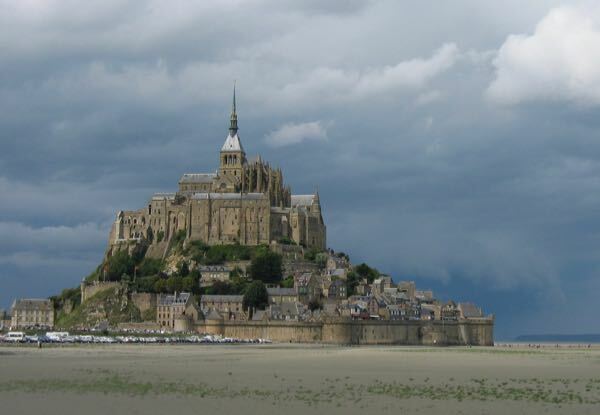 When I visit, like you, I compensate for the baguettes with hours of walking. That’s why I run and walk….to eat French food! I love the spots that are so often overlooked. Guess we’ll need to plan another trip back to Paris to check these out. THere’s so much to see that isn’t always written about….which is why I keep returning! 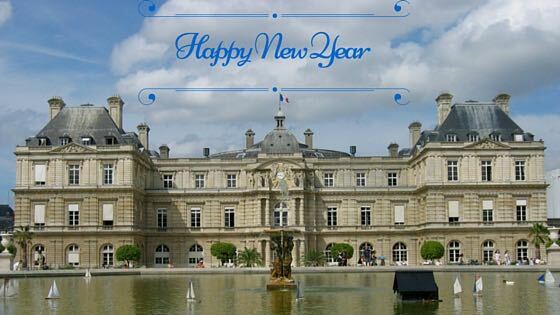 I’m sure it would take a lifetime to explore all the nooks and crannies of Paris—truly a beautiful city! You are so lucky to be spending time there. I know I am so fortunate and grateful. There’s so much here and that’s why I keep returning.